During the main honey flow beekeepers pump honey on apiaries. 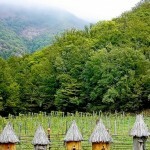 For convenience, they construct a temporary work area or just pitch a tent near the apiary. 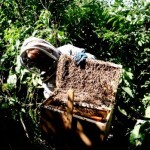 Sometimes, in small apiaries honey pumping occurs after the extensions are removed, the empty cells immediately are put in hives and beekeepers remove honey bees from framework by brush. 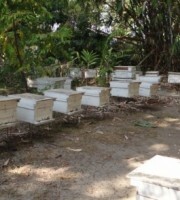 Some beekeepers use smoke for fumigation hive, but the cell can go off, and the bees can be hurt. 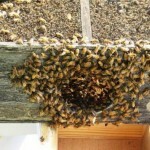 As a guide to beekeeping in such cases it’s better to use a bees remover. This device is used to remove the bees from the upper body with honey, which you want to pump and lower body. To remove the honey frames is better in the evening so the family settles down to the morning. For the production of this bees remover you must take two bars and make from them support for the grating. To do this, the bars must be secured in-store support – 1. On the grid – 2. to drill holes – 3. to make longitudinal slots – 4. Putting grill on the bars, you set frames with windows between the holes and slots (at a right angle to the grid). The holes do not close, but pieces on both sides you cover with plywood. You set finished construction under the honey housing, from which the bees by themselves will go through the windows on the grid. Construction of Bin bees remover is a tray made from a piece of galvanized iron. 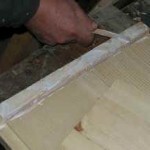 Also you will need dense film, and better plywood, which must be cut to the size of the hive body. This partition is necessary in order that the upper body with honey, almost completely isolated from the lower nest housing. Shifting the upper body you want the wall so as to form a small gap between the walls of the lower (ie, its outer surface) and upper (inner surface) of the case, on which the bees will be able to go. 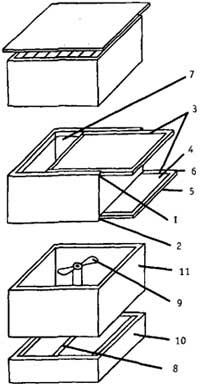 You push tray beyond the sides of the hive under the upper body to the hive. 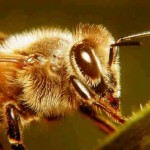 After some time, the bees themselves will move to the lower female body. The use of devices (vacuum and compressor) to blow the bees out of the store with the air stream rather effective way, in addition to saving time. Supers with honey are removed, are placed on a stand, and the bees are blown with air from the space between the frames. Bees fall to the grass in front of the hive, and then quickly fly back and, after a while, calm down. 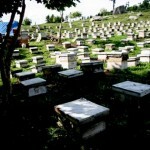 For the manufacture of this design, you can use the old building on the multiple-hive. You saw two cuts in case. Upper cut – 1 – should be at the level of rebates for hangers, bottom – 2 – symmetrically to the first cut. You cut grooves on the inside of the lower cut . You knock bounding boxes from wooden planks – 3 – and pull a small, metal mesh – 4. You insert bounding box through the lower cut, then slide it through a cut and insert the upper frame. Both frames have handles -5 – and trims – 6, which come to a case’s cut. You cover a camera by tin or foil – 7 – from inside. Then you rub sheet by coarse sandpaper and stain it black. You attach electric fan to a wooden frame – 8. 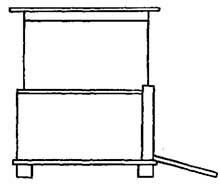 To remove the bees down you put the shoppingrack on tray – 10 – and through it the wooden frame, which holds the fan. You remove electrical wires and the plug through the notches. You put empty housing – 11 – on the shopping rack, and put the case-camera on the top. Next, remove the casing with honeycombs from the hive and put it on the camera body. Pull the bounding box -1, so long as the opposing bracket is in the plane of the transverse wall of the housing, the cover is removed. After the fan and vacuum cleaner blow bees, and they get into the body of the camera. You push the upper frame all the way. After pumping honey, you place body camera on the hive and push the lower grill – 2, so the bees fall beyond the lower housing. Sometimes, beekeepers use chemicals to remove the bees . 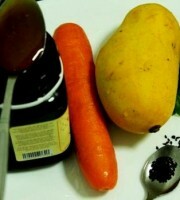 It is recommended to use benzaldehyde in cold weather and propionic angedrid you can use in any weather. You place special FIBREBOARD sprinkled with chemical solution into the open case the sprinkled side up. 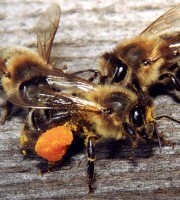 Bees leave nectariferous upper body, and the plate is removed immediately, and the remaining bees are driven into the lower female body with smoke or air. 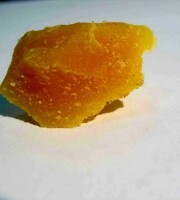 Benzaldehyde is harmless to humans, as the air is oxidized and converted into benzoic acid. 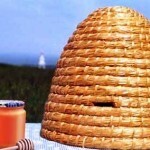 But we recommend be kind to bees and to learn natural beekeeping. It is good to know about bee remover DIY!! !